Microsoft has recently launched Windows 8 operating system, Windows RT and new Windows based PCs with much funfare. However, this time Microsoft did make much needed improvement to the world's most widely used browser. For years, the start-screen of Internet Explorer was ugly compared to Google Chrome and Mozilla Firefox. (Mozilla did copy Chrome's home-screen look). 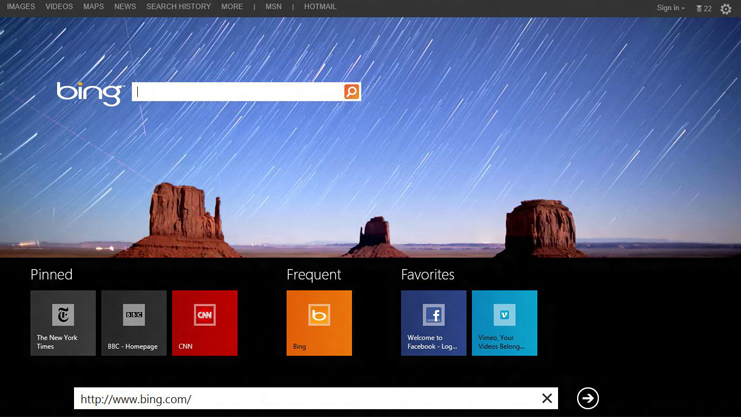 Internet Explorer 10 has an awesome start-screen. Microsoft has made a big design change here. The address bar of Internet Explorer 10 is at the bottom. With this feature you can go to the next article of a news site or any other website 9provided the webste supports this feature) by hitting the forward button. The new IE 10 is faster than previous versions. Google Chrome finally has a competitor in the speed department.